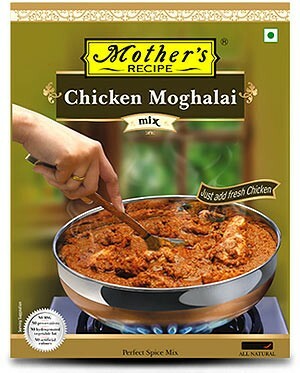 Enjoy the Moghalai favorite with Mother’s Recipe Chicken Moghalai mix. 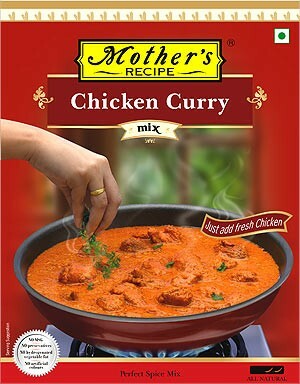 Prepared using only the freshest ingredients, aromatic spices and a mother’s magical touch. Just add contents of this pack, water, yogurt and chicken and Chicken Moghalai is ready! Ingredients: Onion, cottonseed oil, garlic, salt, ginger, cashew nuts, sugar and spices. 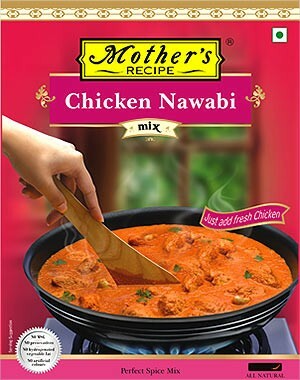 Mother’s Recipe brings you Chicken Nawabi mix straight from the kitchens of the Nawab’s. 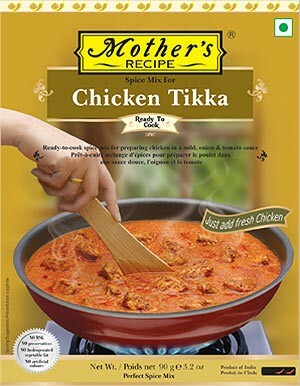 Prepared using only the freshest ingredients, aromatic spices and a mother’s magical touch. Ingredients: Onion, cottonseed oil, garlic, salt, ginger, skimmed milk powder, sugar, tomato powder, cashew nuts and spices. 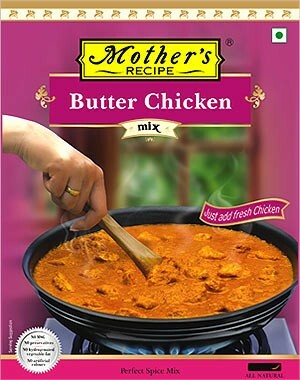 Just add contents of this pack, water, chicken and butter and Chicken Tikka is ready! 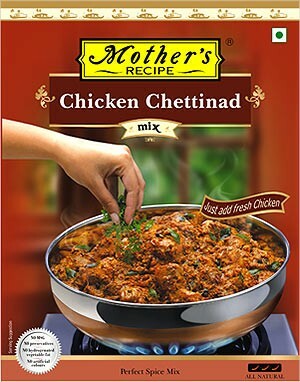 Ingredients: Onion, cottonseed oil, skimmed milk powder, sugar, salt, tomato powder, garlic, cashew nuts, ginger and spices. 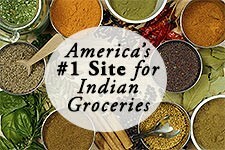 Instant spice mix to an authentic Indian cottage cheese curry. 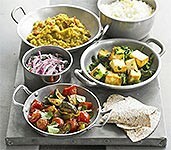 Just add fresh paneer cheese. 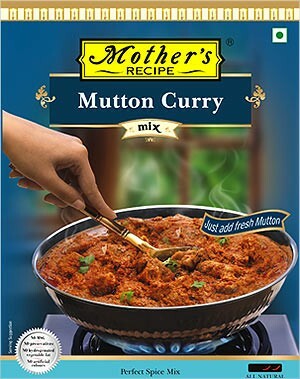 Bengal’s favorite mutton/lamb treat now cooked fresh in your kitchen. 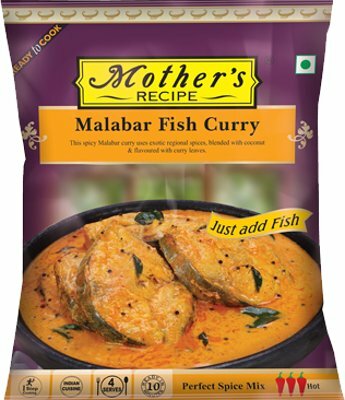 Mother’s Recipe treats you with a popular and authentic dish, ready in a few steps. 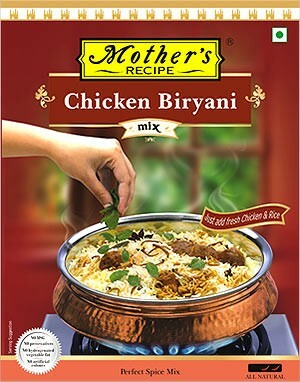 Prepared using only the freshest ingredients, aromatic spices and a mother’s magical touch. Ingredients: Onion, vegetable oil, salt, spices, condiments, dry mint leaves and tomato. 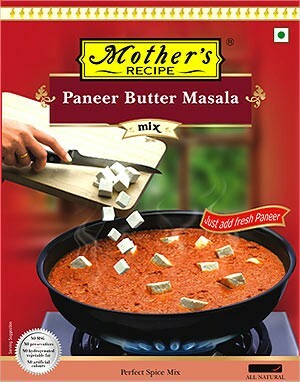 Mughal Royalty brought Paneer Butter Masala to India. 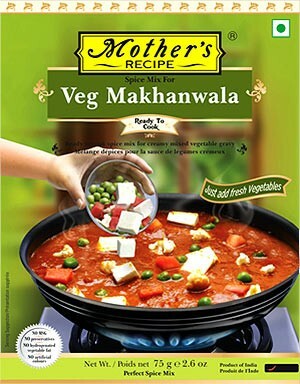 Mother’s Recipe captures this mughal’s specialty in its Paneer Butter Masala mix. Prepared using only the freshest ingredients, aromatic spices and a mother’s magical touch. 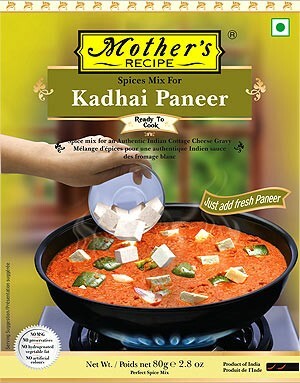 Just add contents of this pack, water, butter and paneer and Paneer Butter Masala is ready! 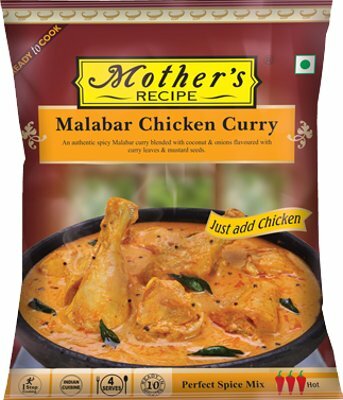 Ingredients: Onion, cottonseed oil, skimmed milk powder, sugar, salt, tomato powder, cashewnuts, garlic, ginger and spices. Pav Bhaji, a special mashed vegetables curry is Mumbai’s favorite dish. 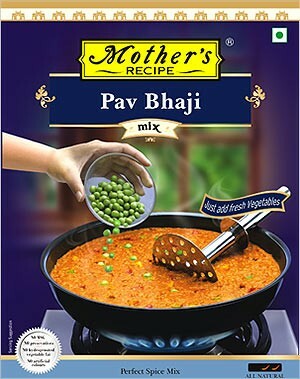 Now it can be enjoyed with Mother’s Recipe Pav Bhaji mix for a quick and authentic preparation. Just add contents of this pack, water and vegetables and Pav Bhaji is ready! Ingredients: onion, garlic, cottonseed oil, tomato powder, salt and spices. 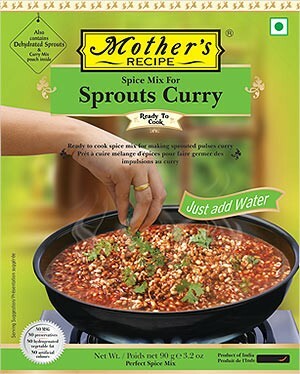 An authentic spice mixture for a creamy mixed vegetable gravy curry. Just add fresh vegetables. Ingredients: Onion (38%), Cotton seed oil (13%), Skimmed milk powder (10%), Sugar (9%), Salt (8%), Tomato (8%), Cashew nut (4%), Garlic (4%), Ginger (2%) and Spices (Cumin, Chilli, Turmeric, Coriander, Cassia, Black pepper, Cardamom, Fennel, Bay leaf). A ready-to-cook spice mix for making an authentic and tasty vegetable rice dish. 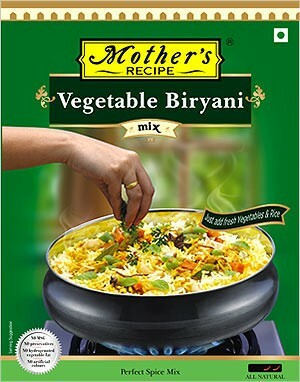 Just add contents of this pack, water, vegetables, yogurt (curd) and rice and Vegetable Biryani is ready! An instant spice mix to make a mixed vegetable curry. 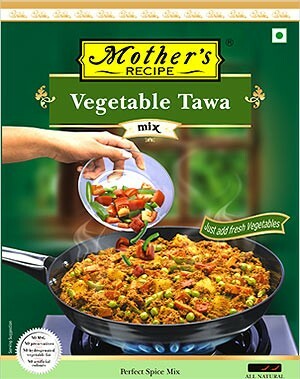 Just add the contents of this pack with your choice of fresh vegetables, cook and enjoy! Ingredients: Onion (30%), Cottonseed Oil (21%), Garlic (13%), Ginger (12%), Salt (10%), Chilli (4.5%), Tomato Powder (4.5%), Spices (Coriander, Cumin, Turmeric, Cassia, Black Pepper, Clove, Cardamom, Mace) and Sugar.